Isobella Jade's Petite Modeling Tips: Model Talk Radio "Sizing up: The Model, the Agency, the Editor, the Designer"
Model Talk Radio "Sizing up: The Model, the Agency, the Editor, the Designer"
What causes change in size acceptance in modeling first? The Model, The Agent, The Editor or the Brand? There have been more diverse models in the past year in magazines and ads, but what causes size acceptance and change first in modeling? Model, author Isobella Jade shares how the agent, editor and the designer can inspire change in the modeling business and how "model size" and "sample size" and a "brands image" go hand in hand. How does size affect your modeling pursuits? She will also give tips on creating your comp card and marketing yourself to agencies no matter your height/size. Her modeling memoir called “Almost 5'4"” is based on being a shorter than average model. The memoir recently hit the UK through The Friday Project, an imprint of HarperCollins. You can also find “Almost 5'4"” on Amazon and BN.com. 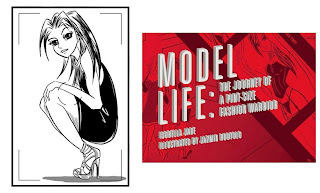 Isobella is also the author of her fashion illustrated graphic novel "Model Life: The Journey of a Pint-Size Fashion Warrior". Her books can be found on BN.com and Amazon.com and in bookstores.